How to Select the Best Wooden Slingshot? 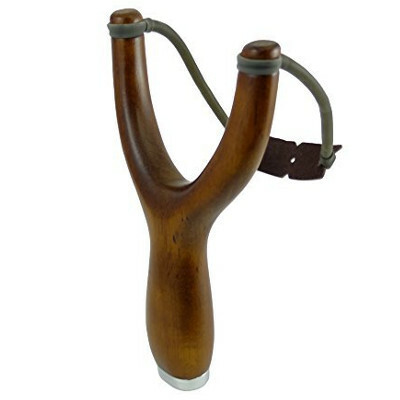 For over 150 years slingshots have been used by both troublesome children and hunters in a range of settings. While typically they were hand-made with a forked branch and elastic, we’re now able to find them for sale both online and in physical stores mass-produced in plastic and aluminum. However, those looking to return to the tried and true ashwood construction are sure to find a wooden slingshot to suit their needs. While not common, they still do exist and are favorites for target practice, hunting and even as gifts for young family members. Within our buying guide, we’ve reviewed five top-rated slingshots that are made of wood and can give even the most technologically-advanced and mass-produced slingshot a run for its money. The majority of wooden slingshots on the market are intended for use with targets. However, by using the right ammo, you can turn a fun toy into a weapon for hunting small animals. It’s all down to the strength of the slingshot, the elasticity of the bands, and the weight of the pouch. As slingshots first became popular with children looking to vandalize property, there’s every reason to believe they can do a lot of damage. In fact, following on from the slingshot’s inception came the realization that they could be used to hunt birdlife and small critters. Therefore, it’s apparent that they can be used to harm people. Whether you’re having fun or you’re taking care of pests, it’s essential that you take care with your slingshot. Avoid shooting around buildings, vehicles, and people. Only ever release the band when you’re sure of your target. Never use it as a weapon on people. Wooden slingshots are made up of very few parts. They are typically constructed out of a sturdy wood such as ashwood and feature a replaceable elastic band with either one, two, or three strands. The wooden slingshot is very underrated concerning its power and ability to take down small game. Even the most basic slingshots built at home could take down small animals within a 30-foot range, using an 8mm lead buckshot or similar. In fact, by the time the first slingshot was mass-produced in 1948, it could draw weight of up to 45 pounds. It’s now no secret that wooden slingshots can be on-par with other weaponry, and there’s even a world record for the most energetic shot made by a handheld slingshot, measuring 135 joules. Well-made slingshots require very little upkeep, but there are a few things you can do to give longevity to yours. Clean and oil the wood from time to time. Ensure you have plenty of spare rubber bands. Ensure the rubber bands are in excellent condition before use. Ensure the pouch is not perished or damaged. Replace all components as and when they start to wear out. It’s suitable for both children and adults. The bands are made of high-quality rubber. It’s suitable for training, entertainment, competition, and hunting. It comes with a spare rubber band. The pouch is made of faux-leather which is less durable than real leather. The wood isn’t solid and can snap. The rubber bands can twist which makes it difficult to make a shot. QWhat’s the best ammo to be used with it? AIt’s quite small and can fit in the palm of your hand. QCan it be used inside? Whether you’re a hunter, a child or you’re looking to scare wildlife away from your crops; this Basport slingshot is a very valid option. While it’s quite small and some customers have had problems with durability, it’s a nice all-around slingshot that’s both attractive and functional. Of course, for the price, it won’t last forever, but with special care and maintenance, it can serve your needs well. Check out what other people who purchased this product think about it. 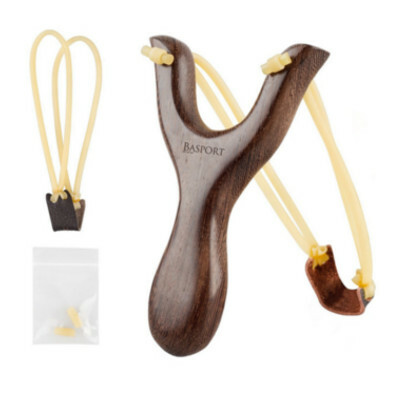 Read Basport wooden slingshot reviews. 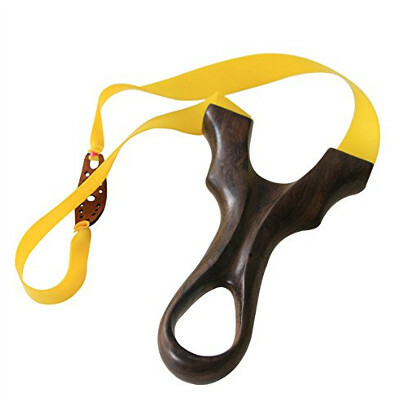 It’s made of solid hardwood to be more durable than many other slingshots on the market. The pouch is made of real leather. It has a metal cap on the bottom for additional strength. It doesn’t come with a spare rubber band. You need to purchase these separately. Dimensions: 1.5 x 5 x 8 inches. QHow many feet can you shoot it? QIs it suitable for target practice or hunting? This slingshot has proved itself as reliable and practical and can be used both in professional or casual settings with ease. It’s durable, made of hardwood, and is well priced on the market to appeal to both hunters and children. It’s clear to see it’s one of the best wooden slingshots for the money. Check out what other people who purchased this product think about it. Read Warm Hearth Gifts wooden slingshot reviews. Both children and adults can use it. You can choose to purchase ammo with it. The rubber band is made out of natural latex tubing, so it’s superior to standard rubber bands. 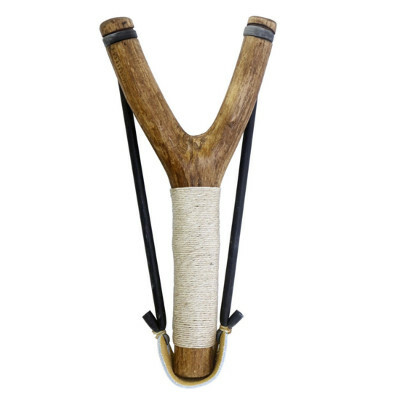 It’s more expensive than several other wooden slingshots for sale online. Dimensions: 7 x 3 inches. QWhat’s the string made out of? QWhat kind of wood is it? AStandard forked tree branches with a walnut stain. QWhat is the pouch made out of? You get what you pay for, so although this slingshot falls into the higher price bracket, you won’t regret purchasing it. Every slingshot is made by hand, and all components are made of high-quality materials, including the latex tubing as the projectile. 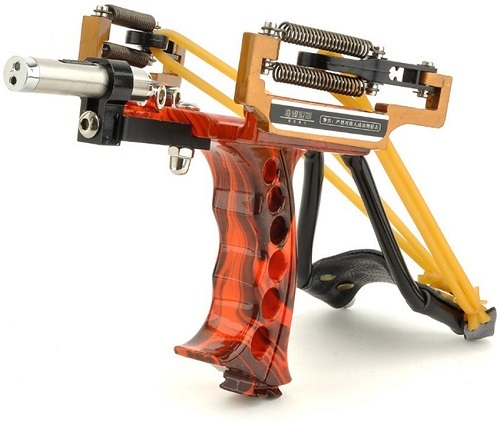 You can even choose to purchase ammo with the slingshot which is not ordinarily an option with other slingshots. Versatile, sturdy, durable and suitable for both hunting and recreation, it’s a top-rated product that certainly ticks all the boxes. Check out what other people who purchased this product think about it. Read Hella wooden slingshot reviews. The rubber band is flat to make it easier to shoot with. Some parts are quite sharp so often need to be sanded to avoid injury. Weight: 5.1 x 3.3 inches. QIs it suitable for children? 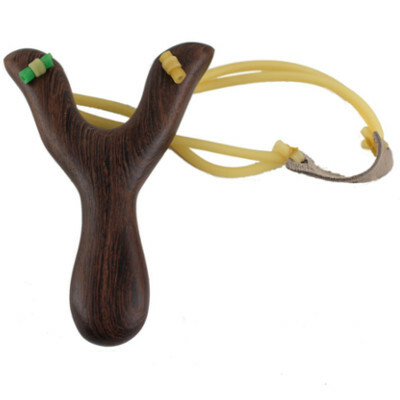 This very aesthetically-pleasing wooden slingshot is perfect for hunting, recreation, and even as a gift for friends and family. It differs from others on the market due to its rubber band. Unlike most bands, this one is flat and wide which gives you more control when firing. It costs very little to own, is durable, and meets the mark as a reliable and solid blackwood slingshot. Check out what other people who purchased this product think about it. Read Toprade wooden slingshot reviews. It has a very economical price tag. It’s suitable for hunting and recreation. It doesn’t make loud noises when firing. It’s quite small so can be cumbersome to hold in large hands. Dimensions: 5.7 x 4.3 x 0.8 inches. QDoes it come with ammo? QCan you kill game with it? Compact enough to fit comfortably in a child’s hands, yet powerful enough to take down small animals by an experienced hunter, this SinoArt slingshot does it all. While it won’t win any awards for being made of premium materials, it does fit the bill as durable and reliable for recreation and hunting. Check out what other people who purchased this product think about it. Read SinoArt wooden slingshot reviews. Where to Buy Wooden Slingshot? Whether you’re a professional or a lover of recreational sports, it’s easy to find a quality wooden slingshot if you know where to look. By heading online to Amazon.com, you are sure to get a bargain.